One of the most beautiful atolls in the Pacific. Well as they say time sure does fly and it is hard to believe we are back in New Caledonia having just returned from Fiji where we spent just over 3 months. The passage from Fiji to New caledonia was very pleasant passage and we covered the 600nm in 3 days 12hrs. Normally you cannot stop anywhere in New Caledonia without first having cleared into the country and the only official clearance port is Noumea on the western side of the country. This often means that many westbound yachts do not get to visit one of the most pristine cruising destinations that the pacific has to offer, the Loyalty Islands which are on the eastern side of New Caledonia. 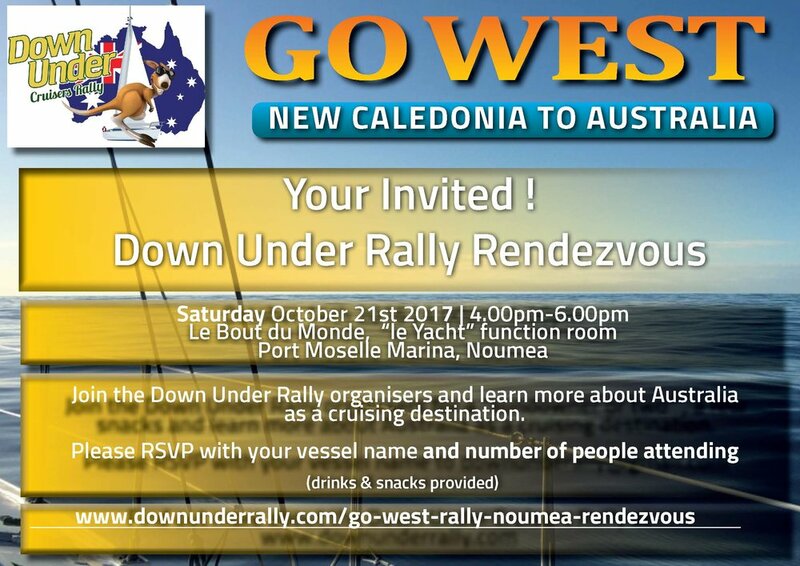 This year the Down Under "Go West" Rally made arrangements for several yachts to permitted to clear into the country in the Loyalty Islands in Lifou. This involved flying in the officials from the mainland so that they could carry out the biosecurity inspection of each yacht and carry out the necessary immigration and customs procedures. The officers and our agent Herve of Noumea Yacht Services arrived as planned in the anchorage at 08:00 on Wednesday 27th and I went ashore in our tender to collect them take them to our catamaran Songlines which was to be their office. I then shuttled Herve and the Biosecurity officer to each boat, collected the passports for all crew and returned them to the immigration officers who remained aboard Songlines. Over the next few hours passports were stamped, boats were inspected and all were successfully cleared into the country and free to begin to explore. Herve and the officials aboard Songlines which is anchored in Lifou. Taking the Biosecurity officer in our dinghy to do a quarantine inspection of each of the yachts in the anchorage at Lifou. Shuttle buses were arranged and everyone went ashore for the ride into town where they were able to visit the bank and get some local currency before hitting the supermarket and stocking up. By 4.00pm everyone had returned to their boats and at 5.30 a few of the crew of the yachts came to Songlines to see a presentation about cruising New Caledonia we provided using the Cruising New Caledonia Rocket Guide. Yesterday we departed Lifou and today my office aka Songlines is located in Ouvea in the Loyalty Islands about 40nm to the east of New Caledonia. With its white-sand beach that stretches over 25 klms, Ouvéa is without doubt one of the most beautiful atolls in the Pacific. Our focus at the moment is on the "Go West Rally" which sails from New Caledonia to Bundaberg. 33 yachts from 11 countries have registered for the Go West Rally with another 32 expressions of interest having been received. The goal for most Go West Rally participants will be to arrive in Bundaberg in time for "Welcome Week" which kicks off in Bundaberg on the 6th November and runs through until the 12th November. Once the Go West rally is over our focus will shift back to the Go East rally. As at today we have received 61 expressions of interest in the 2018 Down Under "Go East" Rally from the Gold Coast to Noumea New Caledonia. During November we expect to finalise all the arrangements with our Go East rally partners and then we will be in a position to determine the rally entry fee and the benifits participants will receive. As soon as all the rally benifits have been finalised we will send out an email to all who have registered and expression of interest informing them that the rally is open for registration and what the rally fee and the benifits will be. At this stage I expect this will be around the last week in November. So thats it from us but before we go just a quick thanks to all of you who have like our Facebook page which has just reached 1500 likes ! May your the water stay on the outside of your boat. May the winds be fair, the seas be slight and the sky be blue. May your days be filled with new adventures, fabulous destinations and excellent friendships. Newer PostBest Kept Secret in the Pacific ?